The Elephant Cave of Ubud Bali is an ancient temple in which pilgrims can say their prayers or do a mindfulness meditation for achieving inner piece and happiness. While you’re meditating in that cave, you’ll be aware of the virtuous life of a hermit without being tempted by worldly temptation. It is situated in Bedulu, Blahbatu subdistrict, Gianyar Regency, Bali. It is about 27 kilometers from Denpasar. Beludu is in fact a unique ancient village in Gianyar. A lot of people believe that it had been the center of civilization on Bali Island. A stone coffin (sarcophagus) was discovered in a villager’s house which proves the existence of prehistoric settlement millions of years ago. Due to its uniqueness and beauty, it is listed as one of the world heritages by UNESCO. LC Heyting, the official of Dutch East India made a report to his government in 1923 that he had discovered the Ganesha, Trilingga and Hariti statues. That was a valuable discovery and the research was continued by DR. WF Stuterhiem in 1925. In 1931, Mr. Conrat Spies found a very artistic three pronged relief of stupa on the collapsed wall at the base of Tukad Pangkung valley. In 1950, the Indonesian Archaeological Department led by JL. Krijgman did another research on this site. During the 1954 – 1979 excavation, found six woman statues with water pitchers at a holy bath pool. The north part of the temple complex is the place of Shaivism, while the south or the Tukad Pangkung area is dominated by Buddhism. Stupas in the position of Dhayni Buddha Amitabha and the three pronged relief of stupa can be found at the Buddhist side. The north temple complex area is closer to the entrance. The Widyadhari and Widyadhara statues are there to greet every visitor who wants to go in to have a look. Each statue holds a water jug with both hands at the belly, where water spouts out from inside the jug. The manmade cave isn’t so big. There’re natural motif carvings around the mouth of the cave and in the middle of it is a fierce guardian face with its eyes leering at the right. It is estimated that the temple complex was built in 11th century and only dim light that lights up the inside of this ancient building. The relaxed atmosphere is very suitable for meditation or for anyone who would like to pray for a good living. There’s the Ganesha statue (Shiva’s son, the god of knowledge) on the west side of the cave, while the Trilingga statue is on the east side. It’s worth visiting as you’ll know more about the story of Ganesha. The Buddhist tradition is more dominant in the south area of the temple complex. A small waterfall and a clean river present a spiritual atmosphere which causes us to feel that it’s necessary to live in harmony with God, nature and fellow human beings. You’ll understand that love rules supreme in your heart. 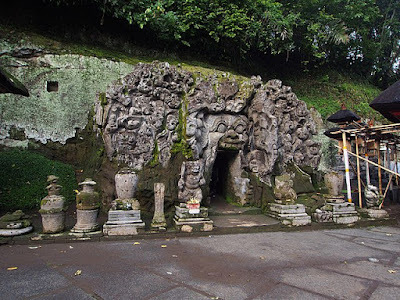 Elephant Cave or Goa Gajah is one of the well known historical sites on Bali Island. It was the noble sacred place for Buddhists and Hindus to worship in the days of Warmadewa Dynasty which ruled the Bali Island from 10th to 11th century.